Winner one year ago when he raised the eyebrows by beating Germany’s Timo Boll in the final, Japan’s 15 year old Tomokazu Harimoto defends his Men’s Singles title at the forthcoming Seamaster 2018 ITTF World Tour Czech Open. Play commences in the Omega Sport Centre in Olomouc on Thursday 23rd August, being preceded by a two day qualification tournament which begins on Tuesday 21st August. Following the withdrawals of Timo Boll in addition to China’s Ma Long and Xu Xin, Tomokazu Harimoto is the no.2 seed, behind Dimitrij Ovtcharov; the German not having enjoyed the best of fortunes on this year’s Seamaster 2018 ITTF World Tour; in four outings he has yet to advance beyond the second round. Next on the list is Tomokazu Harimoto’s colleague, Koki Niwa, followed by Portugal’s Marcos Freitas, the one other player on duty who is a previous Men’s Singles winner in the Czech Republic. In 2014, he secured the title at the final expense of Germany’s Patrick Baum. A major challenge from Japan and one more name from the Land of the Rising Sun appears amongst the seeds; Maharu Yoshimura, the runner up in 2015 when beaten by Hong Kong’s Wong Chun Ting in the final, is the no.11 seed. Title contenders but not amongst the seeds, the names of three in form players who will be required to compete in the qualification tournament appear. 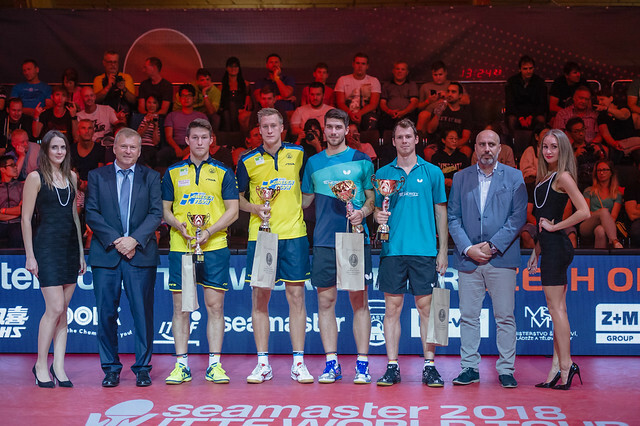 Players who excelled at the recent Seamaster 2018 ITTF World Tour Asarel Bulgaria Open. England’s Liam Pitchford who sensationally beat China’s Ma Long is the opening round appears on the entry list, as do the latter’s colleagues Ma Te and Zhen Peifeng. Notably in Bulgaria, Ma Te beat Liam Pitchford before eventually losing to colleague, Xu Xin in the penultimate round; Zheng Peifeng progressed to the quarter-final stage losing narrowly to Japan’s Kenta Matsudaira, the eventual silver medallist. Most pertinently in round two Zheng Peifeng ended the hopes of Dimitrij Ovtcharov. Olomouc presents an opportunity and especially for the likes of Denmark’s Jonathan Groth, Sweden’s Mattias Falck and Kristian Karlsson alongside Germany’s Ruwen Filus and Patrick Franziska. It is an opportunity to win their first ever ITTF World Tour Men’s Singles title. All appear amongst the top ten names; however, should a new name be added to the roll of honour, they will have a long journey ahead to catch the player who completes the top ten. Vladimir Samsonov of Belarus is in search of his 29th such success! A new champion crowned is a possibility, in the Under 21 Men’s Singles event, it is certainly; no previous winner appears on the entry lost. Japan’s Yuto Kizukuri is the top seed, he is followed by Slovenia’s Darko Jorgic with the Romanian duo of Rares Sipos and Cristian Pletea being the next in line; however, the name to note is that of China’s Xu Haidong, the runner up in Bulgaria, he is the no.30 seed.